Gorilla Combative System (G.C.S.) takes elements from the combative system of Haganah Fighting Tactics (Israeli Combat applications) and the combative styles of Muay-Thai Boxing, Boxing, Lethwei (Burmese Boxing) and ground fighting from Brazilian Jiu-Jitsu. Train in defensive and offensive applications. It consists of upper-body striking techniques such as punches, elbows, head-butts and shoulder strikes. It also includes low-line kicks and knee strikes to the adversary’s entire body, legs, shins and groin. Also included are tactics and skills to avoid being taken to the ground and what to do to if you find yourself on the ground. Become aware of lines, types of attacks, vital points, body manipulations, joint locks, chokes and throws. Train to learn effective techniques to have a quick and successful outcome and escape. This is not for sport, but rather is intended as a street-oriented fighting system. The techniques have not been adapted for safety or conform to a set of rules for competition. This is to protect, defend and to use force against those who have intent to do harm. Common targets include the eyes, nose, mouth, throat, ears, temples, groin, ribs, neck, spine, hair, nervous system, and large and small joints. 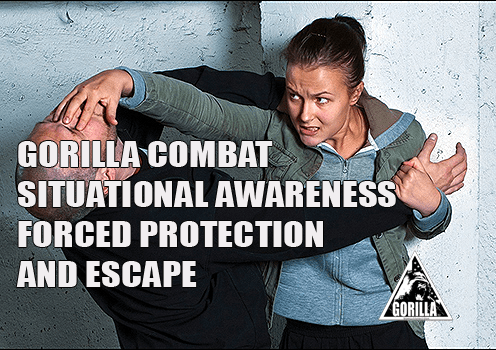 This Gorilla Combative System is instructed in private one-on-ones or in semi-private small groups. Email: info@gorillacombat.com for more details.